2018 marked the twentieth year of Sennheiser Evolution microphones - a range of wired and wireless live performance microphones and wireless systems that took Sennheiser from relatively small-volume broadcast manufacturing to a prime position on stages around the world. Last November, Sennheiser UK marked this auspicious occasion by holding an evening of storytelling, hosted by Jamie Gosney and featuring Michael Polten, Martin Fischer and Andrew Lillywhite, all key members of the Sennheiser Evolution team, as well as Pete Malandrone (guitar tech to Dr Brian May), Joe Campbell (monitor engineer for artists include Chris Rea, Placebo and Adele) and Chris Denman (producer of the live sessions at Global Radio) who have all used, and loved, Evolution microphones for many years. Evolution started as a wired microphone line, conceived as a great leap forward for a company that needed to shake things up in an increasingly competitive market place. Dated manufacturing processes left Sennheiser with a stark choice - evolve or lose the edge. The solution was two-pronged: A new, progressive approach to product design, and major investment in modern automated production facilities. 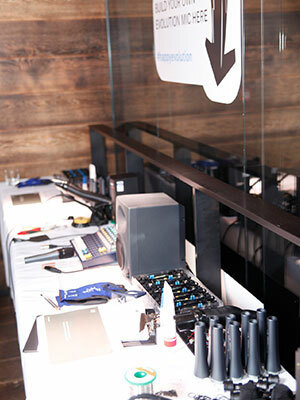 Sennheiser Evolution was the first of the company's product lines to start life with the customer. Before any R&D Engineers were allowed near the project, an international team of sales and marketing specialists were tasked with finding out exactly what musicians, guitar and drum techs, Front of House engineers, and monitor engineers wanted. Michael Polten, now retired, was Director, Customer Relationship Management at Sennheiser during the design of the Evolution Series, and was a key part in its success: "The focus was on the user and what was required by them," he says. "We could have developed another microphone that followed what the competition was doing, but that was not the Sennheiser way. We wanted to differentiate ourselves completely and introduce a range that would be synonymous with the Sennheiser brand." "This was the first range that was completely focussed on what the customer, the dealer, our own sales force and our marketing team wanted," says Polten. "These were the main points that made the range so successful." The next step for Evolution was the wireless space. Martin Fischer is a Senior Product Manager for Sennheiser’s professional division and has been with the company for nearly 32 years. His knowledge and experience were crucial in developing Evolution Wireless, and he recalls the all-important initial design criteria: "It needed to be stage proof, so it should have a rugged metal housing for receivers and transmitters. Transmission reliability, superior sound with exchangeable mic capsules from the Evolution line, ease of use, flexibility, and fulfilling our quality standards were also vital. And last but not least, it should be affordable for musicians." The new Evolution Wireless systems were previewed at the PLASA Show, London, in 1999, with the 100, 300, and 500 series lines. "We also defined the ENG line and the IEM line," notes Fischer. "We managed to bring five Evolution lines to market in a very short time frame." Since that initial offering, Evolution Wireless has gone from strength to strength. G2 - the second generation - brought improved audio and RF properties, new user interfaces and a scan function, along with smaller bodypacks. Then the third generation, G3 (launched 2009), brought IR synchronization, Soundcheck mode, frequency coordination via the Wireless Systems Manager, wider frequency response, and interchangeable microphone heads for the hand-held transmitters. The D1 wireless system joined the party in 2015, expanding Evolution Wireless into the license-free 2.4GHz digital transmission range. And last year saw the launch of G4, with new ENG and film sets in the 500 Series, new Base sets in the 300 series, and upgraded vocal sets in the 100 Series. In parallel with that, the Evolution wired microphones continued to progress. In 2000 the e 865 - the first condenser microphone in the series, was launched. After that came the 900-series, starting with the e 935 and e 945 vocal microphones - another step up in quality, with new, great-sounding capsules, widely praised, and widely used. Andrew Lillywhite, currently part of Sennheiser's European Development and Application Engineers team, was previously Chief Engineer for Sennheiser UK. Six weeks after starting at the company, he was thrown into a very practical development session: "My boss at the time, Dave Hawker - who is sadly no longer with us - said 'we’re doing this thing on Sunday and we need you to be there'." Lillywhite found himself in a North London rehearsal studio with around 20 monitor and Front of House engineers that were already familiar with the existing 800 Series. "The idea of that day was to get feedback from these engineers on what they liked and what they didn’t like about the existing mics, and there were samples of some new secret mics for them to try... That was really the start of the development of the Evolution 900 series... The idea was to take it to the next level." Since those early development days, the 900 Series has continued to expand with a number of models, including the flagship e 965 - Sennheiser’s first true large-diaphragm condenser microphone, with selectable polar patterns. That, along with the e 901, e 902, e 904, e 905, e 906, e 908, and e 914 instrument microphones were launched in 2004. To this day, the Sennheiser Evolution Series continues to, well, evolve. Since the day the decision was made to consult the customer before the R&D team, it has become a true phenomenon, with a wide range of features and budgets to suit a wide range of applications. Something that is well worth celebrating.